We are thrilled to announce the opening of Ramah's 2018 summer season, the 72nd summer of Ramah camping! Yesterday, the Chicago-area day camp opened. Today is opening day for campers at both Camp Ramah Darom in Georgia and Camp Ramah in Wisconsin. In the coming weeks, all of our ten overnight camps, five day camps, and our Israel Seminar will begin. 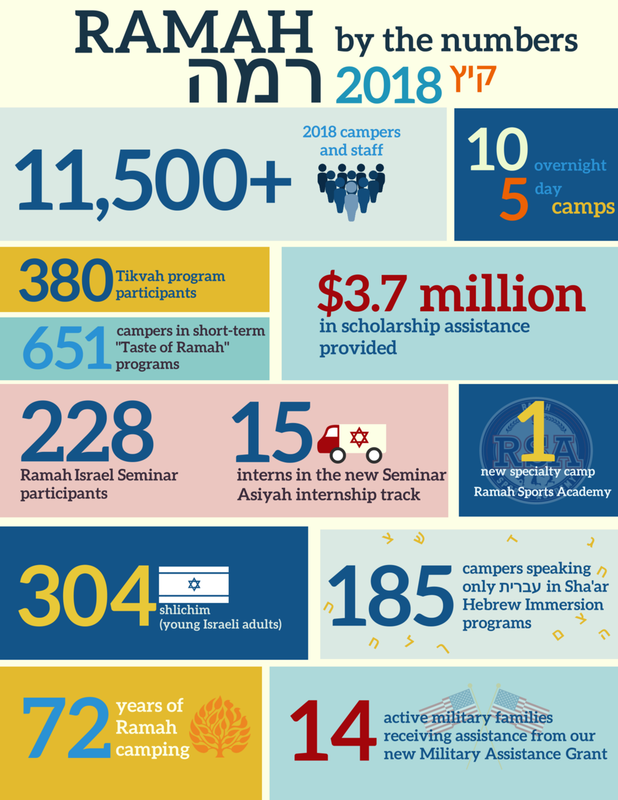 Overall, more than 11,500 campers and staff will participate this summer in a Ramah program, the largest number in history! After many years of dreaming and planning, the Ramah Sports Academy (RSA), Ramah’s first overnight sports camp, will open on June 27 on the beautiful campus of Fairfield University in Fairfield, Connecticut. Over 160 campers from 19 states and 5 countries are enrolled in RSA’s inaugural summer. We are proud of our 228 teens, all graduates of Ramah, who will travel to Israel this summer on the Ramah Israel Seminar, strengthening their love for and connection to the State of Israel. Ramah Israel Seminar’s new Asiyah program provides an innovative option for rising high school seniors seeking an intensive summer internship program in Israel. Through Asiyah, 15 Ramah teens will participate in Magen David Adom (MDA) Emergency Medical Volunteer Program training. More than 300 Israel shlichim will serve as counselors, specialists and teachers at our camps this summer, sharing their love for the Jewish state with our campers and staff members. With the help of many Federations, foundations, and the Foundation for Jewish Camp, the support of many of our partner Conservative synagogues, and the extraordinary efforts of our camps' professional leadership, boards of directors, and individual donors, Ramah has been able to meet the financial needs of the overwhelming majority of families seeking a Ramah experience for their children. As we begin our 72nd summer of intensive Jewish identity-building within the fun, informal atmosphere of excellent summer camping, all of us at Ramah feel privileged to have the opportunity to influence the lives of more than 11,500 participants in our various camps and programs.